Core Gamma Logger (MSCL-NG) – Geotek Ltd. This is a stand-alone natural gamma system designed to obtain both total and full spectral natural gamma data. For high resolution and quality spectral data from sedimentary rocks the system can be configured with up to four NaI(Tl) detectors. The sensor comprises two to four 3″ x 3″ NaI(Tl) detectors housed in 6″ diameter lead shields. Each detector uses a NaI(Tl) crystal optically coupled to a photomultiplier tube and a Multi-Channel Analyser (MCA). 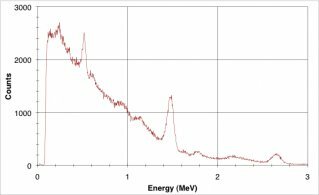 Each of the detectors has a resolution of 6-8% specified at the 0.662 MeV peak of 137Cs. The data are collected by the MCAs over the energy range 0-3 MeV. The detectors make measurements over 1024 channels calibrated to correspond to 0-3 MeV energy range. In the full spectral mode the relative elemental yields of K, U and Th can be obtained if a suitable core standard (with known concentrations of K, U and Th) is available. Two check sources are provided for energy calibration of the detectors. These can be used for energy calibration and subsequent collection of stabilised spectra. The isotopes are 133Ba (giving three identifiable peaks) and 60Co (giving two peaks). 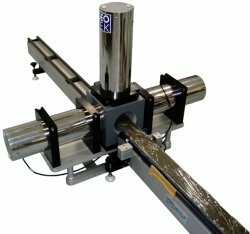 The complete system is controlled through the standard Geotek MSCL software which enables either multi-channel spectral measurements or simply total counts to be recorded. The software gives the user full control of sampling positions and intervals down the core and control of count times so that these can be extended where higher resolution data are required. All the electronics are supplied in a single integrated 19 inch rack unit that contains of all the necessary external electronics including the motor control unit, the microprocessor and rack mounted PC. For the highest quality measurements, the detectors are mounted in purpose-built housings to fit specific core sizes. This helps to eliminate down-core and background gamma noise from entering the data. Length: up to 155cm; diameter: up to 15cm. Each sensor system is configured to fit specific core sizes.